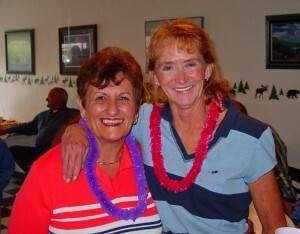 Prineville lost a truly great woman last week when it lost Peggy Puckett! My Aunt Piggy, which is what I have called her for as long as I can remember, loved animals. I didn’t matter if it was cows, dogs, cats, pigs or whatever! She was especially fond of pigs, and she and Nathan were my 4-H leaders growing up. I also kept my pig at their house and I remember riding my bike over to feed during the summer. Her son Buddy and I were so close that it seemed like either I was at their house, or Buddy was at my house all the time. Peggy had a great sense of humor, but she didn’t put up with a lot of crap either. And boy could Buddy and I come up with doozies! Peggy even collected pig knickknacks for a while. I don’t exactly remember when I started calling her Aunt Piggy, but I remember she laughed hysterically and it stuck! Peggy was also a “Garage Sale World Champion,” and whenever you would complement her on a new shirt or sweater, she would smile and say – Garage Sale! The last 15 plus years she has been collecting antique jewelry and loved to show off her latest finds. She did more to help bring the Puckett clan together for celebrations than anyone. She always took care of the arrangements for Christmas and Thanksgiving dinners, and made sure everyone knew what to bring. Peggy was always there to help, usually in the kitchen, but just about anywhere she was needed. When grandma Puckett was still alive, Peggy was always checking on her and doing things for her as well. There were many occasions when she would have liked to kill Buddy and me, and probably should have! We were constantly into mischief and it’s a wonder we didn’t burn down the house, kill one another, or kill our sisters with all the crap we pulled. Yep, she was a keeper and I will miss her terribly! Please keep my uncle Nathan, and cousins Buddy and Lori in your prayers. Peggy was a wonderful Lady and will truly be missed by so many. She had a beautiful smile and the cutest giggle, when I think of her that is what I see and hear and she had a heart filled with love and kindness to share with all who knew her. Prayers for Nathan, Buddy, Lori and family for peace and comfort during this sad time. Sweet tribute to an amazing lady....so many memories of her laughing at and with us, hugging us, taking care of us, and just shaking her heads at the shenanigans :) Praying for all of you.